A professional couple living in Boston have long owned a piece of property in Michigan near their family. 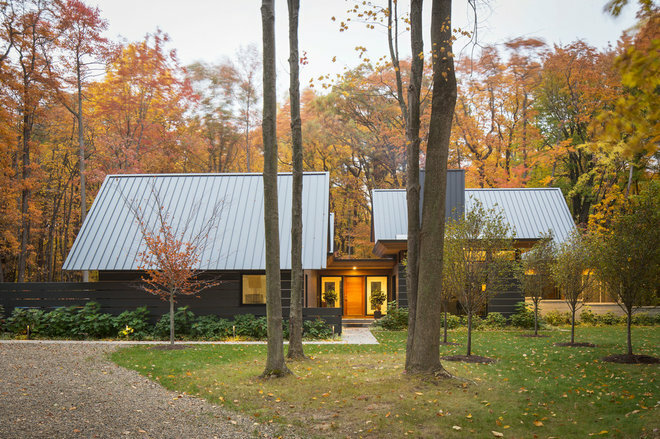 When they decided to move back home, they envisioned a contemporary house in the woods to accommodate their quiet lifestyle, with room for visiting family and friends. The homeowners didn’t want an open-plan interior, but instead sought discrete rooms and areas, according to architect Bryan Anderson and Katherine Hillbrand. So the design team created a house with a pavilion on each end, with windows placed to provide framed views of the woods from every room. The entry features a cedar front door flanked by tall glass windows. To the right of the front doors are the main living spaces, including the living room with fireplace. Here, the couple’s dogs, Gordie and Virg, and Phil the cat, enjoy the view. 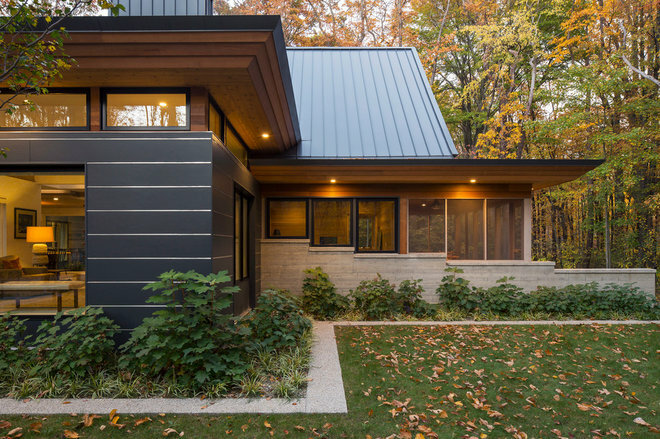 The exterior of the house is covered in fiber-cement siding panels. Clear vertical-grain cedar lines the underside of the overhangs. Cedar walls and ceiling treatments bring the exterior’s cedar roof accents inside. The dining room has glass doors that open to a patio with an exterior concrete fireplace. The kitchen lies beyond the dining room. Circulation patterns in the house are highlighted by a rectified porcelain tile floor. Wire-brushed and whitewashed oak floors create tactile and visual comfort underfoot in the living spaces. 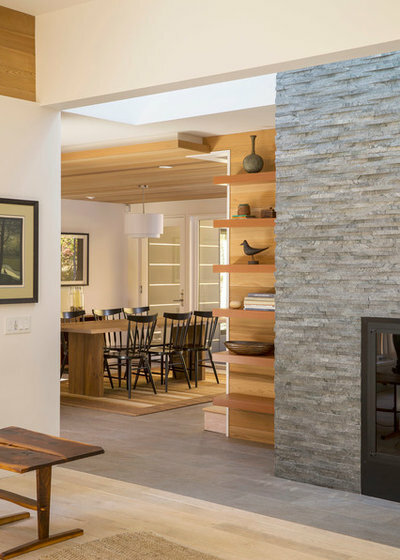 Skylights throughout the home bring in soft, diffuse light from above. One of the homeowners is a trained chef who was more interested in cooking within the confines of a kitchen that can be closed off from the living and dining areas than one out in the open. 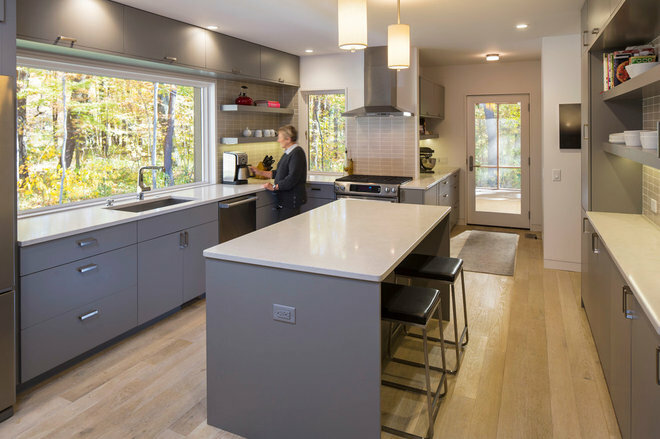 Gray cabinetry is paired with durable quartz countertops. A separate buffet and pantry provide additional storage and expand usability outside of the central work zone. 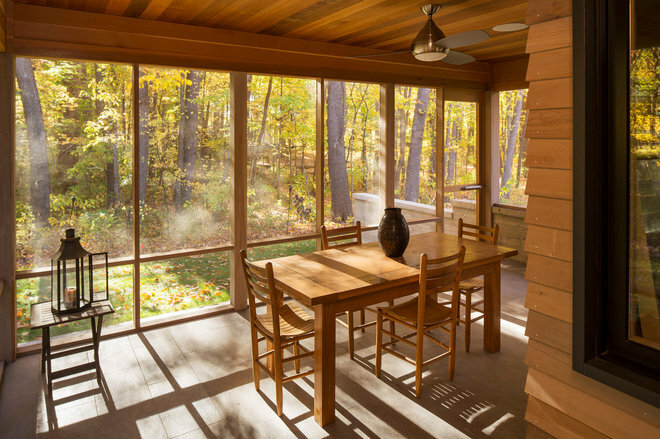 The large picture window borrows from the pavilion theme and frames a panoramic seasonal forest. 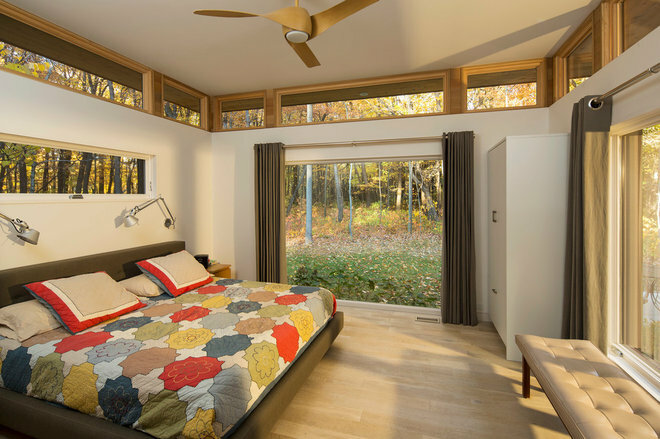 The bedroom in the master suite utilizes clerestory windows above large picture windows. In the master bath, a skylight above the tub brings in additional light. 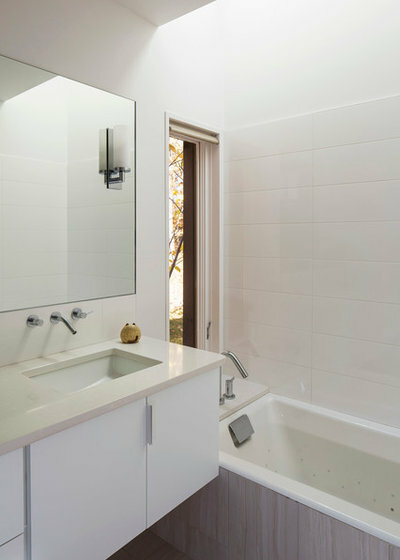 The tub and walls are covered in large-format ceramic tile with rectified edges. The countertops are quartz. On the back side, the house steps down via a board-form concrete wall, which anchors the house to the site. Inside is a study and porch. 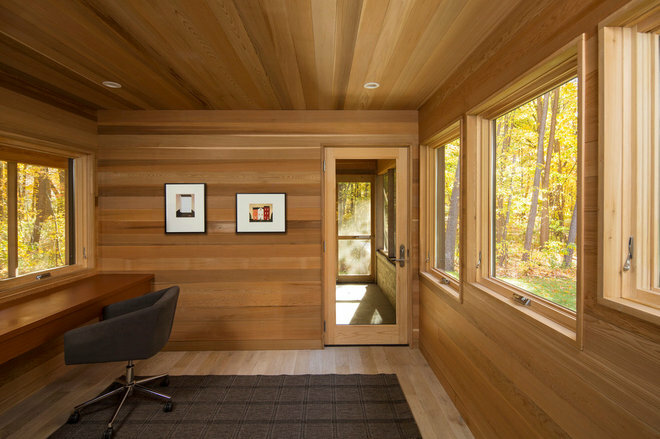 The wood-paneled study is a compressed, compact space with views of the outdoors and a door leading to the porch. A built-in ledge serves as a desk.